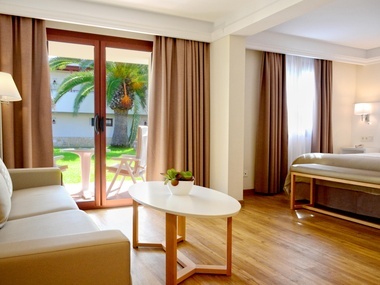 Spacious and comfortable rooms that provide everything you need for a perfect holiday. These rooms are fully equipped, down to the last detail. From these rooms, enjoy spectacular views of the tropical gardens and or swimming pools. 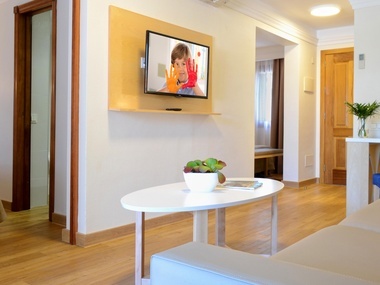 Our 4 star suites can be adapted to all your needs. For those on holiday as a couple, we offer the Junior Suite and Junior Suite Premium, the latter being located in a separate adults-only area. 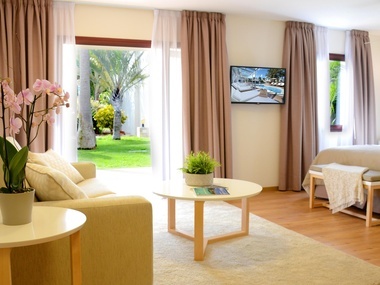 If you are travelling as a family, this 2 Bedroom Suite in Fuerteventura is the perfect choice. 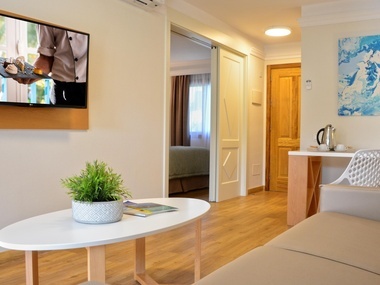 These 383 suites in Fuerteventura can adapt to your every need and are prepared and designed to accommodate whole families, couples or groups of friends. Discover our diverse range of rooms and book the one that is best suited to both your needs and those of your loved ones. Bright and spacious suites that guarantee maximum relaxation. 214 Junior Suites with “open plan” bedroom, dressing room, lounge with a double sofa bed and furnished balcony or terrace. Renew your energy whilst being lulled by a sense of tranquillity. 86 Junior Suites located in the “Premium Club Adults Only” area, with “open plan” bedroom, dressing room, lounge with a double sofa bed and a furnished balcony or terrace. Bright and spacious rooms designed to ensure that your stay is as enjoyable as possible. 42 Suites with one bedroom, dressing room, a sliding door that separates the bedroom from the lounge with a double sofa bed and furnished balcony or terrace. Ideal rooms for families who need additional space and privacy. 41 Suites with two bedrooms, a dressing room, a sliding door between one bedroom and the lounge that has a double sofa bed (the other is “open plan”) and furnished balcony or terrace.